The world’s largest social network Facebook has started rolling out its Timeline for Pages. This is a much expected move from Facebook. Currently, it is not visible to everyone, but once the roll out is complete it will become visible to everyone. Once it is open to everyone, you will get a better idea of how things going to look like for you. According to company, the change will be reached to all users by the end of March, almost three months after the feature was entirely rolled out to personal accounts. 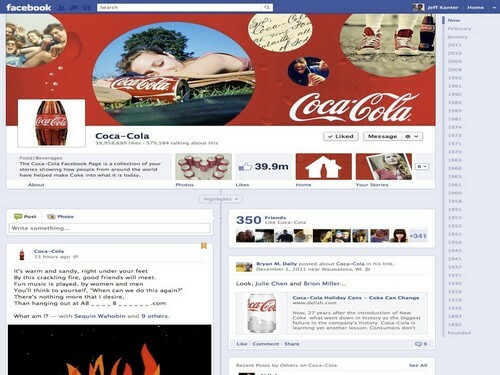 The Timeline for Brand Pages will be expected to push Facebook’s marketing and advertising edge among brands even more. The new feature has currently been rolled to many famous brands, including Coco-Cola and Starbucks. This new feature will certainly look amazing and will not only benefit Facebook but also the brand. Timeline feature has already been an impressive change that the social network brought to personal profiles. Now, the social networking giant is hoping to bring similar creativity to its brand pages. The height of going creative can be obvious on the personal pages of Anti-Drug Timeline Message and also with marketers forcing new Facebook layout to their bag of tools. The new feature will help brands to devise some new and creative methods to promote their products and services. The rolling out of new layout would certainly be an alerting sign for the Facebook page administrators who need to spend some time and work hard to get most out of the new layout. To keep the existing content that has already been posted on the page still looks impressive, administrators should have a real tough time for sure.